Usually, most types of vimaanas or temple towers raise over and above the four walls that surround the sanctum sanctorum (Garba griha). The Saanthaara vimana is a special type of vimana, in which an outer ambulatory wall is constructed around the garbagriha and the overall vimana is made to rest on two parallal walls instead of one. 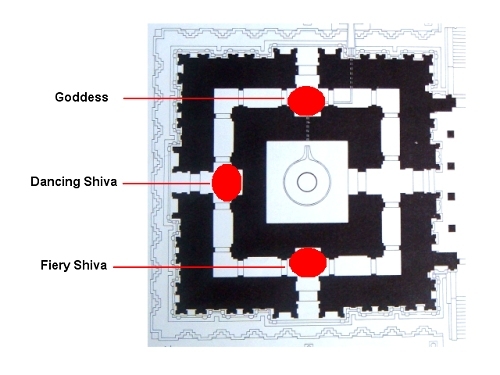 This arrangement enables the temple architects to extend the overall base area that is available for the vimana. It also helps to distribute the heavy load of vimana on to the floor - using eight walls instead of four walls. In such an arrangement, the gap that is in between the outerwall and the inner wall of the garba griha becomes a circumbulatory passage for the devotees to go around the inner garbagriha. 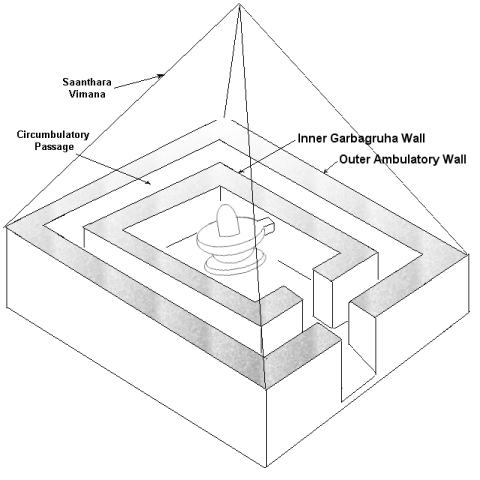 For convenience, we will call the outer wall as the ambulatory wall and the inner wall as garba griha wall. 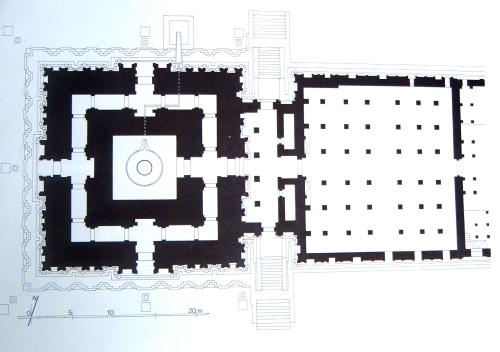 The ambulatory wall should be clearly distinguished from the generic temple enclosure - which surrounds, not just the garbagriha, but the whole temple complex. 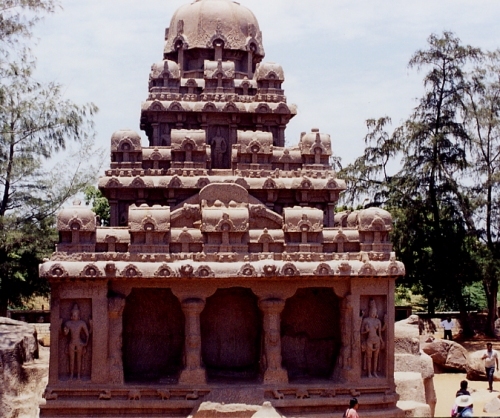 One of the earliest examples of saanthara vimana construction attempts that survives till date, can be found at Adhyantha kaama parameswara gruham - better known as the Dharmaraja ratha - of mahamallapuram(1). 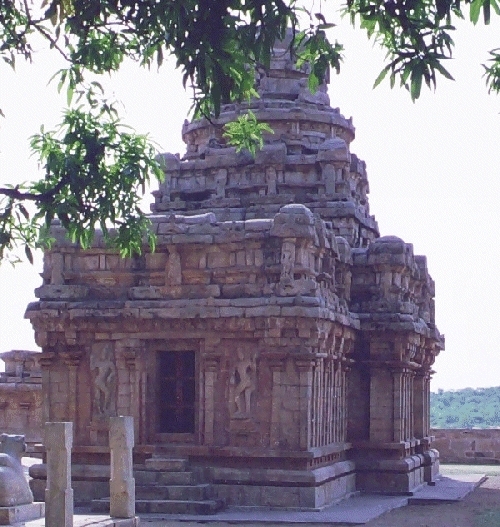 While the aadhi thala structure of this fine rockcut monolith was never completed, attempts to carve out a circumbulatory passage can be seen on the eastern side of the temple. Though such a garba griha construction never became a popular choice of ancient artisans, we do see some marked attempts in places like Kanchipuram (Kailaasanatha and Vaikuntha perumal temples), Thiruppattur (Kailaasanatha temple), Uttiramerur (Sundareswara Temple) and Naarthamalai (Vijayalaya choleeswaram). While the Kanchipuram and Thiruppattur temples were conceptions of Pallava artists, the Naarthamalai temple came out of Muttaraiyar Shilpis. Focussing on specific constructional details of these ambulatory and inner walls, one finds a wide variety of styles being adopted in different places. The inner wall that constitutes the garba griha has atleast one major opening - usually along the eastern direction, so as to provide a view of the main diety. It may or may not have openings - windows or doors - in the other three directions. Similarly, the outer ambulatory wall also has atleast one main opening along the eastern direction - laid symmetrical with the opening on the inner wall. But, unlike garbagriha, it is usually provided with windows and/or doors on all the other three directions, in order to provide ventilation and light to the circumbulatary saantaaram passage. When the inner sanctorum wall as well as the ambulatory wall has door openings on all the four directions, it becomes possible to view the enshrined deity from all the four directions. Raajarajeeswaram, the pinnacle of Chola architecture and the monumental project undertaken by Rajaraja-I the great under the architectural leadership of Kunjara Mallan alias Raajarajap Perunthachchan is bestowed with a saanthara vimaana. The circumbulatory passage that runs between the ambulatory wall and garba griha has attracted international attention because of the Chola era paintings, painted along the lengths and breadths of the walls - on either side. The passage also has three huge icons in all the three directions except east, where the great imposing linga - aptly termed as Raajarajeeswaram udaiya paramaswamin (now called Thanjai Peruvudaiyar) - can be viewed by the devotees. Our focus in the paper, is on these three icons. The ovarall architectural arrangement of the saanthara vimana with its icons represents certain unique aspects that are not seen anywhere else in the country. Infact, Raajarajeeswaram temple - as a whole - boasts many such unique icons and architectural aspects that have been analyzed to some extent in the available treasies. As shown, the width of passage itself is relatively small when compared to the width of garba griha wall or ambulatory walls. The astounding thickness of these walls is truly justified by the imposing 216 feet srivimana which they have to support. The walls on either side that make up the ambulatory passage are divided equally in all directions and massive paintings adorn the walls. The icons are aligned with the inner wall and are located at the centre of the passage , in each of the three directions. There are three big door openings (or Thiru vayils) flanked by two dwara paalakas (4) - in the center of outer ambulatory wall, in each of the three directions. The icons are located just behind these openings. Thus, if the doors are kept open, these icons can be seen from the outer prakaara. However, one also has to take note of the absense of stone steps in all the three directions. Thus, it is evident that the three openings on the ambulatory wall were not meant to be accessed on a regular basis by one and all. Whether they were meant for special access on certain occations or just meant to provide better light into the circumbulatory passage - we are not sure. The passage of Raajarajeeswaram has the following icons - located one in each direction. Icon on the Southern Facade : Veera Bhadra? The southern facade houses a massive representation of a shaivite icon - possibly shiva himself. 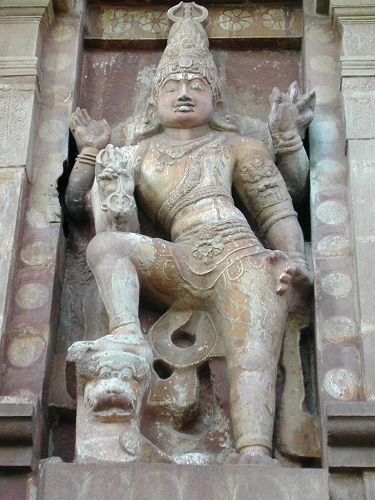 Figure - Icon on the southern facade : Shiva? Whether it is a fierce form (ugra moorthy) of the deity or not is a question. Because, the presence of protruting corner teeth, fiery round eyes and presence of weapons in both hands and the absence of the blessing hand (Abhaya hasta) give us an impression of ugra moorthy. But a big and yet gentle smile that adorns the lips of this deity defys the iconographic projections quoted earlier and leaves us with a question as to what mood this icon is suggesting. The icon is roughly three meters tall. 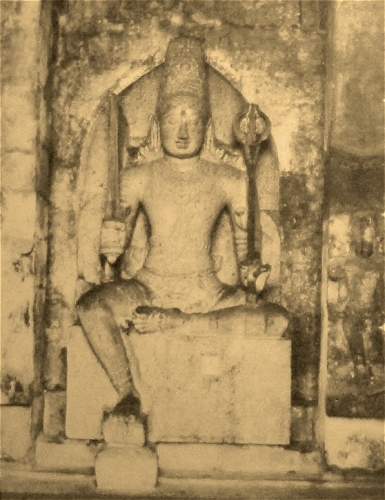 Seated in sukaasana posture with a bent left leg, it has only two hands - the left holding a Tirishula (Trident) and the right holding a big straight sword that extends even above the face of the deity. The right hand is raised above the hip level whereas the left hand is held over the bent thighs. In the left hand, the index finger and the small finger are slightly protruding - providing a feel of grace to the holding hand. It is important to note that the icon has been represented with two hands instead of four or more. The absence of a third eye is also a significant aspect. The Jatamakuta is adorned with ornaments. Small snakes are worn as ear ornaments (Naaga Kundalaas) as well as shoulder ornaments. Though there are small snakes, absence of a big snake around the neck is notable. A vastra upaveetha with knot (Brahma mudichchu) runs across the chest and a udharabhandha with exquisite ornamentation is also seen. Neck and chest are adorned with Sarappali and other maala ornaments. The short cloth that is worn below the hip is held tight with the help of a waist band which has a tiger face in the centre. It can be recollected that tiger faced and lion faced waist bands are characteristics of most rajaraja period sculptures. It is also interesting to note that the icon sits on a aasana that not only provides a base but also a back rest to the diety. The aasana as well as the diety have been carved out of a single rock. Identification of this icon has been problamatic and no consensus is available among the scholars. One school of thought is that this icon represents Veera Bhadra - a creation of Lord Shiva. According to the puraanas, Veera bhadra was created from a strand of Shiva's hair by Shiva himself, while he was in extreme frustration and anger after his wife Sati (or Daakshayini) immolated herself in the sacred pyre of the Yagna organized by her father, Daksha Prajapathi. Subsequently, the intense Veera Bhadra destroyed the entire Yagna and killed Daksha - even Lord Vishnu's discus, Sudarshana, failing to stop him. Thus, Veera Bhadra is concieved as a fiery representation of Shiva and he gains a prominant place in many shaivite temples across South India. Worship of Veera bhadra has gained ground especially in the Karnataka and Andra regions over time; the famous temple at Lepakshi built by a general of Krishna Deve Raya in Andra Pradesh is called Veerabhaderswara Temple. In Raajarajeeswaram, a Veera Bhadra icon is already available on the Devakoshtas or Niches carved all around the Aadhi tala structure. Infact, this veera bhadra is located pretty close to the icon we are presently discussing. Even a bird's eye comparison of this veera bhadra on the outer wall and Passage icon yields distinct differences. The one located outside has a big mustache, holds the Trident on the right hand and a cut skull vessel (Kapaala) on the left. He does have snakes as shoulder ornaments but wears a big one as udharabhandha. He has more than two hands. Hence, if we were to accept the Passage icon as Veera bhadra, we end up with two distinct representations of veera bhadra inside the same temple. It is difficult to find shaivite aagamic texts that permit establishment of the very same form of moorthy or deity in two different places, inside the same temple premises. The other view point is that this represents "Aghora" form of shiva or "Rudra Moorthy" - which will be discussed under the section "Sadashiva forms in Saantharam Passage ?" The western facade houses a very beautiful icon of a dancing shiva. Unlike the previous icon, this dancing shiva is fully painted with organic paints (believed to be natural elements or plant extracts) of chola era - possibly over a thin layer of pilaster on top of the original stone sculpture. The whole figure is bracketed within a very big thiruvaasi(like that of Nataraaja). The attractive jatamakuta, adorned with ornaments and painted in golden colour - raises above the face to a very significant height. It has been found out from chemical analysis that the paint used for jatamakuta consists of original gold particles. This gives us the notion that even precious metals were mixed with appropriate compounds to evolve newer colours. The forehead has a forehead band (Netri pattai). A small skull (kaapala) is seen in the centre of the Jatamakuta ornamentation. There is a half moon crescent and a small snake with raised hood, on the top-right hand side of the Jatamakuta. The big face of the lord is graced with a mild smile. Eyes are bright and piercing. 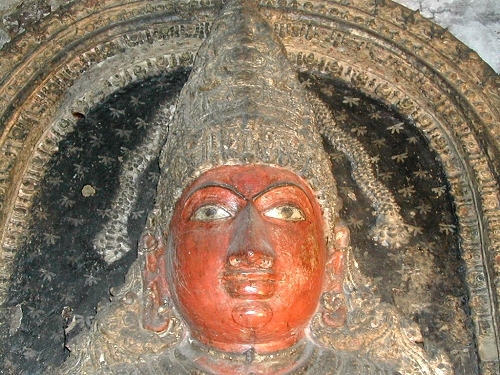 A third eye has been painted in red, in the centre of the forehead. The nose is particularly sharp and long. Two highly ornate Makara kundalaas adorn both ears. Small flowers have been painted towords the top of the ears and give an appearace that the lord has inserted those flowers in the gap inbetween his ears and head. The neck is occupied by a big cobra with raised hood, apart from other ornaments. The lord wears a curling updavitha and a udharabhandha. A highly ornamental waist band has a lion face (Simha mukha) at its centre. Various strands of cloth and ornaments have been beautifully arranged all over the hip and thighs. Another cobra, once again with a hood raised and bent to its right, runs over the waist band and its hood is blessed by the touch of the left palm of the dancer. The lord has ten hands, out of which eight are holding weapons or objects and two are in mudra posture. The first right hand is in abhaya mudra (blessing / fear not posture) and the first left hand is in gajahastha mudra - thrown almost entirely to the right side. The second left hand holds half cut skull (Kapaala), the third holds a shield(Kedaya), the fourth holds a noose (Paasam thread) and the fifth holds a very small trident (Tirishula). 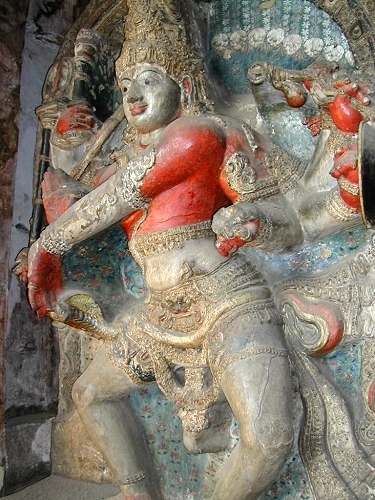 The second right hand holds a big trident(Tirishula) with a long stem painted black, the third holds a sharp straight sward, the fourth holds a weapon called shakthi and the fifth holds a small staff. The legs are slightly bent around the knees, in mandala posture. A female figure, possibly paarvathi is seen to his left hand side and the bhootha ganas (attendents) playing instruments are seen on the right. Like the earlier souther facade icon, this sculpture of dancing shiva is also an excellent monolith from the chola sculptors. Some scholars have identified this icon as Sandhya Nruththa Moorthy(5). Sandhya means evening and sandhya nruththa moorthy is a dance form expressed by the lord in the evening. 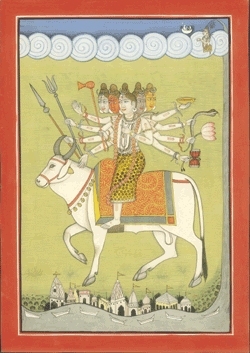 It is one of the 64 forms of Shiva. It does not fall under the natyasastra's 108 karanas, though. Others, who have rested their arguements on the sadashiva expression across the icons say this is Sathya Jotha Shiva. we will take this up in a later section. The northern facade houses a female deity flanked by two female attendents. This icon, fully painted is in seated lotus (Padhmasana) posture. The painting - possibly over a layer of pilaster - is particularly striking as the entire face has been painted in full red colour. The whole figure is bracketed within a thiruvaasi that is not round but is rather elliptical towords the top. Some flowers, may be jasmine are painted over the space that fills the thiruvasi and the deity. A karanta makuta with elaborate ornamentation adorns the head and two strands of flowers - rather a not so usual depiction for female godesses - spun out of the makuta on either side. 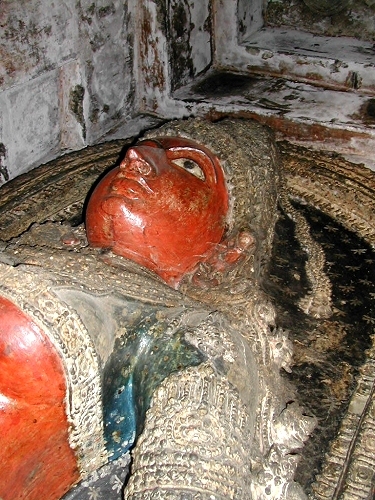 The expression on the face of the goddess is rather blank, possibly because of the thick red paint. There is a very very thin smile. Because of the big watchful eyes, even a serenity or calmness does not seem to be fully established. The red dot (kumkum) on the forehead is not seen properly because of the red paint application all over the face. Nose is sharp and chins and jaws are rather stiff. The neck portions are covered by a cloth that can be compared to moden jackets - but this jacket covers only half of goddess brests. Elaborate ornamentation is seen on the jewels worn by her and a thick udhara bhandha runs over the chest. The thin shoulder ornamentation deserves special notice and it is connected as far as the neck by a series of small pieces of jewellary. The whole arrangement is very beautiful. The goddess holds rosary or prayer beads (japa maala) on one hand and a lotus on the other. Two female attendents blow air over the goddess by means of kavaris - on either side. This goddess has been identified as Goddess Manonmani(6) as well as Vaamadevi (the feminine aspect of Shiva Vaamadeva). The sadaashiva concept postulates that Lord shiva manifests himself in five forms - these are called Isaana, Tatpurusha, Aghora, Satyojatha and Vaamadeva. The concept was well established across India and that it was quite popular with Chola king Raajaraja is attested by one of the metallic idols he donated to Raajarajeeswaram temple called Pancha Deha moorthy (A deity with five bodies). This form is considered to be a representation of the five forms. Another evidence to this fact is available right on top of the Keralaanthaka vimana - in the form of a rare sculpture called Sadhasivamoorthy. Here the lord is shown with five heads and ten arms. The variations of this sadaashiva concept are too many. In North and Central India, we can find Pancha Mukha lingas (or five faced lingas) which are thought to be the expressions of the same concept. The Pasupathinath temple in Nepal which houses a four faced linga inside a sanctum sanctorum, that opens out on all the four directions is one good example. 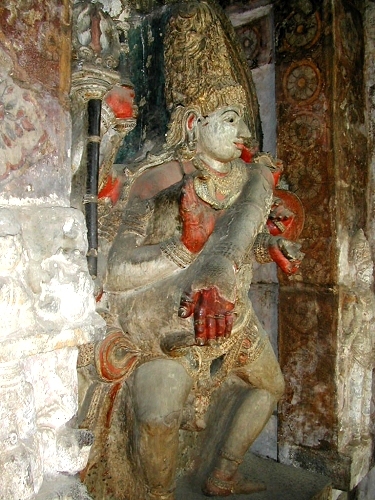 Another classic example from a bygone era is the sadaashiva form expressed in Elephantha caves. One particular aspect that emerges out even on a surface level study, is that in all of these expressions, a single icon expresses all the five aspects. The present author could not identify any group of representations wherein each of these facets have been expressed by a different icon. The Sadaashiva form as represented in Elephanta is a good example of artistic expression of the above concepts. Here, only three heads are shown - the one above the heads (Isaana) and the one behind are implied but not represented. Unfortunately, this icon does not show the body of the lord and hence we are not able to concieve the posture and weapons associated with each of these forms. If we were to match the directions associated for the forms with that of elephanta sculpture, we end up with Tatpurusha face facing us, Aghora on the right and Vaamadeva on the left hand side. Representation of Aghora as a fearsome being and Vaamadeva as a female (Uma) are to be noticed. But the above explanations also leave many unfilled gaps and raises lot of questions. * Matching the icons with the three aspects, we end up with Tatpurusha as the Linga face and Isaana as the space above the Linga. 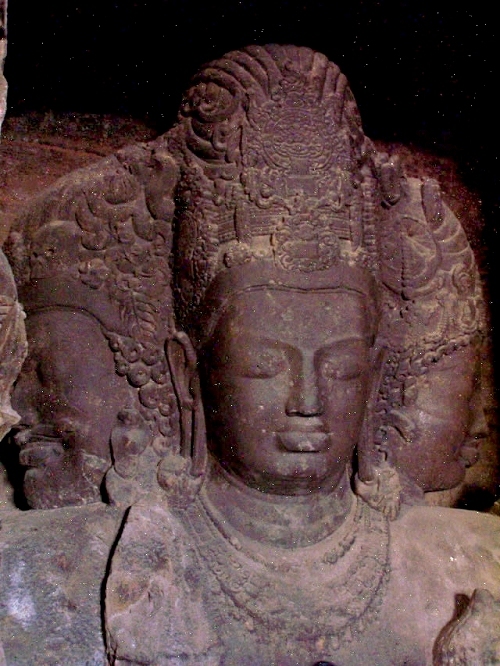 But in elephanta, Tatpurusha has been represented as a Human face - not linga. * The colours of Aghora and Tatpurusha / Isaana are unmatched. * It is rather difficult to explain the minute aspects of each of the icons like the weapons held, ornaments worn (like Naagabhandha), expressenions on their face etc with the above theories unless more material is unearthed to support the theories. * It is difficult to find independent representations of the each aspect of Sadaashiva that can be equated to those found in the Saantharam. Infact two of the chola period examples quoted from Inscriptions (Pancha deha moorthy and Mahaasadashiva moorthy) themselves are singular icons exhibiting all the five aspects. It is rather difficult to fit a concept for all the icons that have been represented in the Saantharam. The sadaashiva concept is something that comes very closeby, but lot more things need to be studied and analysed before the actual genisis behind these fantastic icons are fully understood and appreciated. It is quie possible that these icons have embraced more than once concept or theology. (4) While many scholars are identifying these icons as dwarapaalakas (or door guardians), Dr.Kudavoil Balasubrahmanyam has opined that these are the 10 weapon carriers (Daasayudha bheras) of Lord Shiva. Refer Thanjai Raajarajeeswaram by the author.